One more chance for BBQ before leaving Tennessee. J and I got up just before lunch time in Nashville. Our next stop was four hours away in Indianapolis where we were going to spend the night before going apartment hunting in Kalamazoo. It seemed like a good stopping point. One of my “must see” stops was a BBQ joint in Nolensville, TN. I thought it was north of Nashville but it actually ended up being a half hour south. I was ready to just skip it, but J talked me into it. We were in no hurry to get to Indy, so why not get one more good meal before heading home. 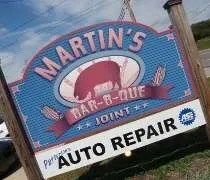 Martin’s Bar-B-Que Joint is one of Nashville’s best. It’s on Nolensville Road just outside of Nolensville, TN. 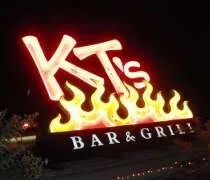 I actually heard about this place from the same Bon Apetit article that raved about Slow’s and Zingerman’s Roadhouse. While BBQ may have been the thing I was most looking forward to on our trip, line dancing at the world famous Wild Horse Saloon may have been J’s. We weren’t planning on being in Nashville long. 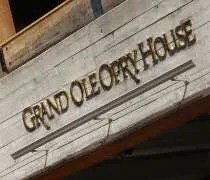 We did our trip to the Opry, checked into the hotel, relaxed a little bit, then headed downtown for dinner and dancing. 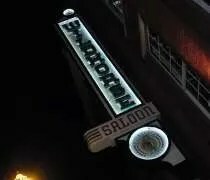 The Wildhorse Saloon is on 2nd Street in downtown Nashville. It’s an old warehouse that has been converted into a three story bar. The tree lined street that runs in front of it is sort of narrow, but there is street parking on either side. 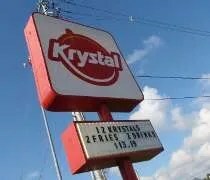 The first time we drove by, we missed it. The trees must have been covering the sign. As we were driving around the block, we found the back service entrance, made a note of which businesses were around it, then drove back around to 2nd Street to try again. Once we spotted the building, we started looking for parking. I didn’t see any garages, but I got lucky and found street parking right across the street. The meters were off, so we didn’t have to pay to park in downtown Nashville. I don’t know when it happened, but at one point when I was living in Peoria, I started listening to country music. Growing up, I hated the stuff. Only the “hicks” at my school of 400 listened to country music and I wanted to be cool, so I listened to hip hop. Thankfully, I grew out of that phase, but I was left in radio limbo. What do I listen to? I tried to be interested in classic rock, but no luck. The radio station I worked at in school was a Top 40, so that’s what I ended up listening to. Since my job in Peoria involved me being ina car most of the day, I just tuned in the Top 40 station. After hearing the same Jessica Simpson song eight times in one day, I started scanning the radio. I ended up on a country station from Galesburg, IL which is about 35 west of Peoria. I just started listening and eventually, the music grew on me. Now, J and I are big country music fans. We’ve seen almost every major star in concert and used to religiously watch CMT’s Top 20 Countdown. When we decided to go to Tennessee for our honeymoon, there had to be a stop in Nashville. When J and I were planning our honeymoon, we decided we were doing a BBQ tour. Originally, the plan included a stop in Memphis, but once we realized how far Memphis was from not only Nashville, but Lansing, we scrapped that part and will hit it later. I was a little bummed. I could spend a few days in Memphis just eating. Screw the sights, bring me some good Q! 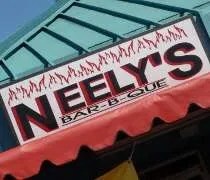 Since we were going to Nashville, I knew there was still a way to get that good BBQ. There’s one Memphis family who has a Nashville location as well and once we left Pigeon Forge, we went straight there. I wasn’t going to write about any of the attractions we went to, but this was too good to not say something about. Usually, I’m not a fan of aquariums. When I was little, I was forced to the Shedd Aquarium in Chicago more times than I would have liked. In fact, one was too many. I hated it. It was so boring. So, when one of our friends recommended Ripley’s Aquarium of the Smokies we were skeptical but willing to give it a shot. 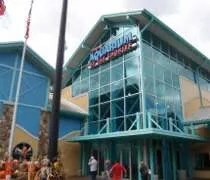 Ripley’s Aquarium of the Smokies is just off The Parkway in Gatlinburg. It’s one of the first things you run into if you’re coming from Pigeon Forge (which is a beautiful drive, btw). In true Ripley’s fashion, the building itself is something to look at. It doesn’t have the stuffy feeling of a museum and it’s not an old building with Gothic architecture. It’s a modern design with a lot of glass. The ticket window is actually outside before you get to the main doors. The cost for adults was $20, but like I told J, that was cheaper than the freakin ferry ride to Mackinac Island, so in the grand scheme of things, it probably wasn’t that bad. The ticket lady tried to get us to buy tickets to other Ripley attractions in town which would have saved money if we were going to more than one, but we weren’t.